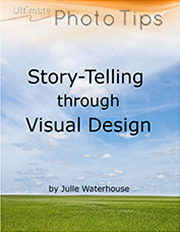 The visual design elements of photography include light, line, shape, texture and perspective. Use the lines and shapes created by contrasts of light to create an effective picture composition. Light is a photographer’s raw material. form the basic building blocks of an image. In other words, the boundary between a light and a dark area, or between a red and a green area, creates a line, or the edge of a shape. Color: Color refers to the different hues in an image: red, green, brown, purple, etc. Brightness: Brightness, or tone, refers to the degree of lightness in an image. We usually separate a photograph into areas of light tones, mid tones and dark tones. In a black and white photograph, you have only one color, so you must rely on differences in tone to create shape boundaries between objects. In a color photograph, you have an additional tool to create boundaries. Consider that your photography composition is comprised of a red tree amongst a group of green ones, as in the following photographs. 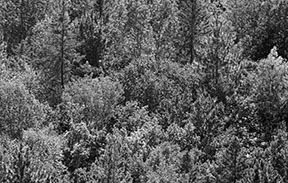 Both the red and green trees have the same degree of brightness, so in the black and white version, the red tree simply gets lost, and merges into the green trees. If, however, you photograph the scene in color, the red tree stands out easily because the contrast in color creates a visual boundary between it and the surrounding green trees. and the photograph loses all of its impact. 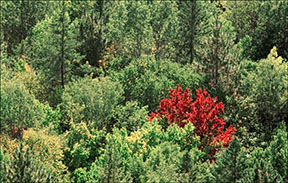 Color contrast separates the red tree from the green ones. It is important to note that color and tone can also express emotion. Light tones tend to lift the spirits, while dark tones are perceived as moody. Red is a color of passion. Blue – well, we’ve all heard the expression about "feeling blue." Use color and tone to reflect the mood you are trying to create in your image. The angle of the incident light also has an effect on the picture composition. Back or side light highlights details, and may reveal textures or lines in the image. Light from high above (like the sun at midday) causes unpleasant, harsh shadows, and is usually to be avoided. Next, I recommend you read about another visual design element: lines.